Bradley Beach Mayor Gary Engelstad speaks to residents and veterans during the borough Veterans Day ceremony in Riley Park Nov. 11. – Coaster photo. 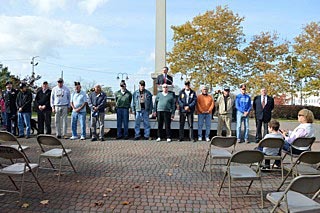 Bradley Beach remembered and honored veterans during a Veteran’s Day service on Tues., Nov. 11 at Riley Park where residents were urged to assist veterans, hire veterans, visit veterans or just say thanks. Mayor Gary Engelstad along with Council members Norman Goldfarb, Thomas Volante, and Sal Galassetti were on hand to welcome Captain Robert J. Charles, Jr. of the Brennan Stands Alone Foundation and the dozens of veterans who attended the service. After the Bradley Beach School directed by Anthony LeProtto played the National Anthem, Reverend Jerome Nolan of Church of the Ascension opened the ceremony with a prayer. The mayor followed reading written recollections of soldiers from the Revolutionary War, Pearl Harbor, Vietnam, and the Iraq War including a entry from a Revolutionary soldier who wrote about the Jersey Shore and Bradley Beach. The mayor then introduced Captain Robert Charles, Jr. who was mobilized in support of Operation Enduring Freedom in Afghanistan, Task Force Med 455th Air Expeditionary Wing from October 2007 to October 2008, where he served as Officer in Charge of Emergency Medical Treatment. He also served as a staff nurse in the Intensive Care Unit for a joint-staffed, forward deployed, Level II hospital at Forward Operating Base Salerno Afghanistan. Charles also developed nursing competencies and documentation guidelines for the Khost Provincial Reconstructive Team Physician Training Program to create a functional Afghan national clinic. He has been awarded the Bronze Star, the Afghanistan Campaign Medal, the National Defense Medal, Global War of Terrorism Service Medal, Overseas Service Ribbon, and the Armed Forces Reserve Medal with M device and the Combat Action Badge. In March 2008, Captain Charles was selected as Task Force Med, Medical Provider of the Month for all Regional Commands in Afghanistan. “We must remember not just today, but everyday, the debt of gratitude and support for the freedoms we enjoy in this great nation,” said Charles who then spoke about Army First Lieutenant Charles Brennan of Howell, NJ whose father, Jim Brennan, spoke at the Veteran’s Day service in Bradley Beach in 2013. First Lieutenant Brennan was one of two survivors after an improvised incendiary device exploded under their humvee on May 7, 2008. Charles was the officer in charge when Brennan was hospitalized where he treated 400 casualties and had a 97 percent survival rate. Charles urged the audience to assist veterans, whether it’s by hiring them, visiting a VA hospital, donating to a veteran’s support group or just saying thanks. “We must take time to show our veterans the pride we have in being an American and acknowledge the roles they have played in assuring our freedoms. We can do better and we must do better,” he said, adding that fewer than 10 percent of the population can claim the title of veteran. “Veterans have given us freedom, security and the greatest nation on earth. We must appreciate them and support them in any way possible,” he said..
Before the ceremony’s closing, Engelstad asked veterans in the audience to stand in front of the stage.